A famous children’s book author with a yen for younger men is murdered in her splendorous Summit, Utah home on New Year’s Eve. There’s ample blood but no body. So who did it and where’s the corpse? HBO’s six-part Mosaic, also available as an “interactive movie” on mobile apps, begins as an immersive spellbinder before eventually plodding to the finish line under its own diminishing power. 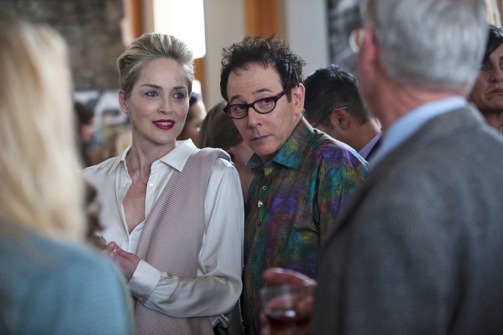 Accomplished director Steven Soderbergh (Ocean’s Eleven and its two sequels, Traffic, Erin Brockovich) does succeed, though, in resuscitating the acting career of Sharon Stone, who gives a bravura performance until her character suddenly goes missing. Mosaic doesn’t immediately lose momentum after Stone’s Olivia Lake is relegated to just a few flashbacks in the remaining four hours. For quite a while, the hook stays imbedded. But the bounce-around storyline, with amateur sleuth Petra Neill (Jennifer Ferrin) striving to exonerate her convicted con man brother, Eric (Frederick Weller), has an increasingly difficult time making ends meet. Another story telling lapse is the oddly cooperative behavior of hunky aspiring graphic artist Joel Hurley (Garrett Hedlund). His comportment gradually becomes almost as puzzling as the puzzle itself. Both Petra and dumpy police detective Nate Henry (Devin Ratray) come to believe he’s the real killer. And he sure couldn’t make it much easier on them, voluntarily returning to Summit after living happily in Louisiana. As with most latter day whodunits, Mosaic shifts into reverse -- in this case flashing back four years -- after first putting Joel on the receiving end of a likely arrest warrant. Back then he was making ends meet with odd jobs, such as bar tending at a fundraiser to benefit a children’s art workshop founded by Olivia and dubbed Mosaic. Her renown is drawn from a single mega-selling children’s book published some 25 years ago. Olivia is still a striking looking woman who increasingly needs to be seen as such. Her companion/confidante, JC Schiffer (Paul Reubens far removed from his Pee-wee Herman days), initially checks to see if Joel plays for his team or hers. Getting the answer she wants, Olivia turns on her high-beam flirtation lights, which can be pretty blinding. Would Joel like to set up shop in her studio, where he could work on his drawings while also living rent-free as a handyman? Olivia fully expects other services, but immediately frosts over when Joel’s girlfriend, Laura (Maya Kazan), makes an impromptu visit to the studio. He’s allowed to stay in residence as a festering underling while Olivia begins swooning for another guy who pops into her orbit. That would be the duplicitous Eric, who’s been hired as a go-between by wealthy Summit ne’er do wells intent on bilking Olivia and getting her to sell her long-held property. Instead, in a turn of events that strains credulity, Eric and Olivia quickly fall in love and get engaged. This prompts him to make a full confession to Olivia at her in-home New Year’s Eve party. It’s not a wise move at all, with events soon conspiring to implicate Eric in her murder. Beau Bridges later drops in as Summit sheriff Alan Pape, who won’t take no for an answer when it comes to putting Eric behind bars. Allison Tolman, the breakout star of Fargo’s first season on FX, briefly plays a public defender with little interest in getting him off. So Eric accepts a plea bargain, and everything is nice and tidy until his sister, Petra, swallows her distaste for him and begins her own investigation. She’s assisted, sometimes grudgingly, by detective Henry, who’s tired of being lightly regarded. Petra’s light-bulb-over-her-head deductions repeatedly depend on the kindness of strangers -- who in fact seem too kind rather than understandably suspicious. In the end, the killer is more or less unmasked. But so is Mosaic, which disappoints down the stretch instead of paying in full on a six-hour investment that can be made on consecutive nights if you choose. It’s by no means a complete waste of time. Just don’t expect to quite get out of Mosaic what you put into it. Not that any of this is Stone’s fault. Her character is a victim. But she’ll be the benefactor after a first-rate, take-notice performance that should create some very good opportunities down the road. In the end, maybe Mosaic will be mostly remembered for that.